The AWEX EMI closed on 1936c – down 7c at auction sales in Australia this week. 90% of the 37,527 bale offering cleared to the trade, with the 10% pass-in rate heavily influenced by the 17% pass-in from Western Australia auction. Merino Fleece is suffering indigestion from an ever increasing supply of “drought affected” Merino wool, which is causing some problems for processors looking to keep mills running cost efficiently. This week’s negative EMI result was the 7th successive week of slight price falls which now total 91c, or just 4.4%. The positive news was a noticeably increase in buyer activity on these lots this week in Sydney. The largest falls measured a meagre 0.6% and only affected the sub 17 MPG’s. All other MPG’s were similar in percentage falls with the exception of the 19.5 MPG which added 1c. Crossbreds were in limited quantities in the northern region so we look to the Southern market for quotes. The bullish trend continues for crossbreds, pushing the MPG’s up 65c for the 28-MPG heading into record price territory at 1268c. The 30 MPG rose 35c, also into new price record territory hovering at 998c, and posing the question of when the 1000c mark will be achieved. 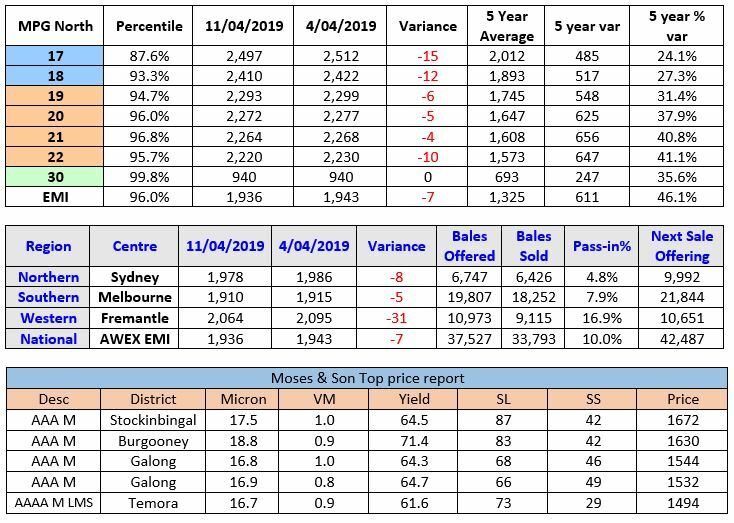 Forward Price Report from Michael Avery (Southern Aurora Wool): The spot auction market continued its trend of the last two months with Merinos again easing and Crossbreds continuing to be in demand. Forward markets held at last week’s levels early in the week with both 19.0 and 21.0 trading at near to cash. 19.0 traded May at 2275 (cash 2281) and 21.0 June at 2250 (cash 2251). The forward curve flattens as we head into the new season. Limited quantities bid out to December 2020 with processors willing to take the risk on some stock of 19.0 at 2150. Although at a 130 discount to the current cash, it is in line with the average price for last November (2160) and above the two year average for 19.0 micron of 2120. Closer in exporters are looking to hedge some forward business but demand remains tepid so volume is low. 21.0 microns is bid at 2230 out to June. Twenty cents under cash but could represent fair value as the market has fallen 120 cents in the last seven weeks. This highlights the fact that risk is at a premium. Although the market trend remains bearish, exporters are keen to reduce risk where possible as the tight supply increases the likelihood of continued volatility. Crossbred forward pricing remains at historically high levels but well under the record high cash levels. 28.0 micron bid into the spring at 1100 cents and 30.0 at 900 cents. With 28.0 at 1236 and 21.0 at 2251 the ratio sits at 55% the highest for the last 3 years for Crossbreds to medium merinos. Commentary: Feedback from IWTO Conference in Venice, Italy, started to filter through from my colleagues yesterday as the Conference drew to a close. Predictability for main focus remained Sustainability, and the Life Cycle Analysis of our beautiful fibre. Plenty of discussion about the importance of National Wool Declaration and some new dialogue on the way forward for Quality Schemes and Traceability back to farm. The trend all driven by the pressure on retail to tell a story of the origin of the fibre and the welfare of the animals.